James Douglas “Doug” McGuire, son of James McGuire and Thelma (Burns) Anderson, was born April 10, 1958 in Lebanon, Missouri. He departed this life on April 10, 2019 in Barnes-Jewish Hospital, St. Louis, Missouri, at the age of sixty-one years. On October 8, 1983, Doug was united in marriage to Lisa Marie Hunt and together they have shared thirty-five years of marriage. 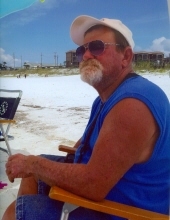 Doug was preceded in death by his grandparents, Joe and Joyce Burns, John and Grace McGuire; and a sister, Amy Jones. He is survived by his wife, Lisa McGuire, of Lebanon, Missouri; his children, Mandy Hanson and husband Mike, of Springfield, Missouri, and Josh McGuire and wife Liz, of Lebanon, Missouri; his grandchildren, Makala, Luke, Abby and Sammy Hanson, and Nevaeh, Gavin, Jase, and Greyson McGuire; his father, James McGuire, of Lebanon, Missouri, his mother, Thelma Anderson and husband Jim, of Lebanon, Missouri; his brothers, Todd McGuire of Camdenton, Missouri, Joey McGuire and wife Rhonda, of Lebanon, Missouri; a sister, Tammy Phelps, of Oklahoma; brother-in-law, Benny Jones; brothers-in-law, Tommy Hunt and wife Renee, of Oklahoma, Lynn Hunt and wife Peggy, and Alfred Hunt, all of Macks Creek, Missouri; a sister-in-law, Terry Barclay and husband Jeff, of Urbana, Missouri; as well as a host of other relatives and many friends. In his spare time, Doug cherished spending time with his grandchildren and family. He enjoyed going to the casinos with his buddy Willie. He loved spending time outside, sitting on his porch, watching the grandkids and visiting with people. He was a loving and a caring neighbor and friend. We celebrate his life and his accomplishments and will treasure the memories he created for his family and friends. Funeral services will be held at 1:00 p.m., Monday, April 15, 2019, in the Allee-Holman-Howe Funeral Home, Camdenton, Missouri. Burial will follow in Mt. Horeb Cemetery. Visitation will be from 6-8:00 p.m. Sunday, April 14, 2019 in the funeral home. Memorial donations may be left at the funeral home. To send flowers or a remembrance gift to the family of Doug McGuire, please visit our Tribute Store. "Email Address" would like to share the life celebration of Doug McGuire. Click on the "link" to go to share a favorite memory or leave a condolence message for the family.